Options 30 oz. 5 lb. Small Breed - 1 lb. NUPRO All Natural Dog Supplement was researched and developed by a doctor of nutrition, using fresh, premium quality health food ingredients. A totally holistic product, it will provide your dog with the full range of vitamins, minerals, enzymes, amino acids, and essential omega fatty acids - All in their Natural Raw Forms - that he/she does not get from processed foods. In other words, what we are doing is replacing with natural ingredients what a dog would normally have gotten in the wild. An excellent All-In-One daily supplement for all breeds and all ages - Puppies to Seniors. 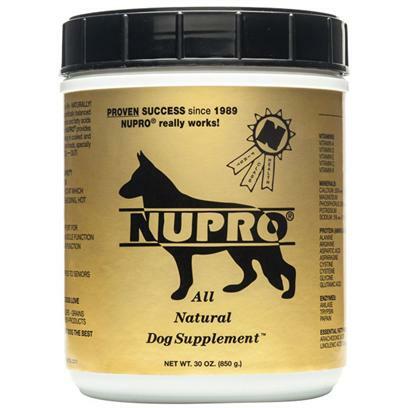 NUPRO All Natural Dog Supplement is formulated as a powder, and is not a concentrate, which allows it to be easily assimilated into your dog's system and digested with your dog's food. There is no sense in giving an animal this superior product if they do not digest it properly. Whether you use commercial dog foods, home-cook for your animals, or feed the B.A.R.F. diets, NUPRO All Natural Dog Supplements should be a fundamental part of your pet's daily nutritional program.